The key influencers visual helps you understand the factors that drive a metric you're interested in. It analyzes your data, ranks the factors that matter, and displays them as key influencers. For example, suppose you want to figure out what influences employee turnover, which is also known as churn. One factor might be employment contract length, and another factor might be employee age. See which factors affect the metric being analyzed. Contrast the relative importance of these factors. For example, do short-term contracts have more impact on churn than long-term contracts? The metric you analyze must be either categorical or numerical field (aggregates and measures are not yet supported). Tabs: Select a tab to switch between views. Key influencers shows you the top contributors to the selected metric value. 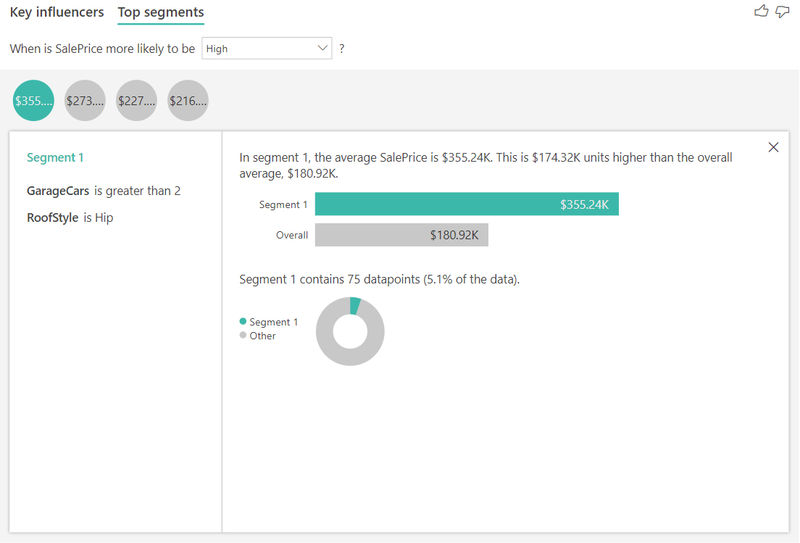 Top segments shows you the top segments that contribute to the selected metric value. A segment is made up of a combination of values. For example, one segment might be consumers who have been customers for at least 20 years and live in the west region. Drop-down box: The value of the metric under investigation. In this example, look at the metric Rating. The selected value is Low. Restatement: It helps you interpret the visual in the left pane. Left pane: The left pane contains one visual. In this case, the left pane shows a list of the top key influencers. Restatement: It helps you interpret the visual in the right pane. Right pane: The right pane contains one visual. 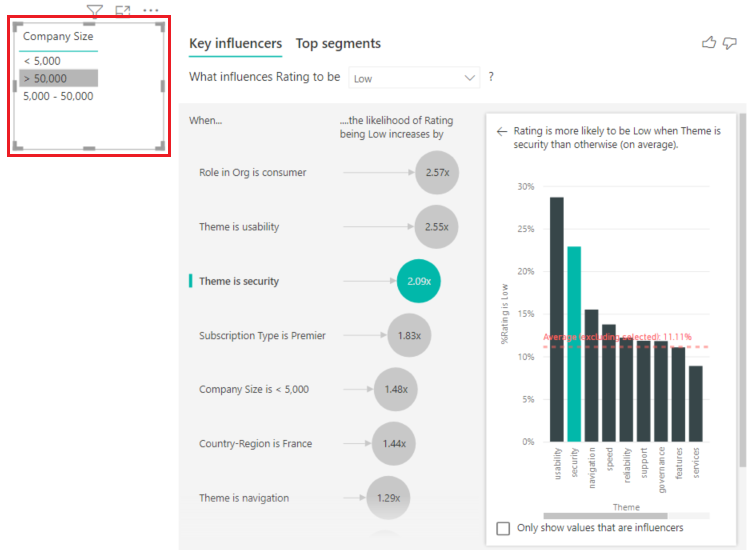 In this case, the column chart displays all the values for the key influencer Theme that was selected in the left pane. The specific value of usability from the left pane is shown in green. All the other values for Theme are shown in black. Average line: The average is calculated for all the other possible values for Theme except usability. So the calculation applies to all the values in black. It tells you what percentage of the other Themes gave you a low rating. In other words, when a rating is given by a customer, that customer also describes the reason or theme for the rating. Some themes are usability, speed, and security. Theme is usability is the second-highest key influencer for a low rating, according to the visual in the left pane. If you average all the other themes and their contribution to a rating of Low, you get the result shown in red. Of all the other themes given, only 11.35% are higher than usability. Check box: Only show values that are influencers. Watch this video to learn how to create a key influencers visual. Then follow these steps to create one. Your Product Manager wants you to figure out which factors lead customers to leave negative reviews about your cloud service. 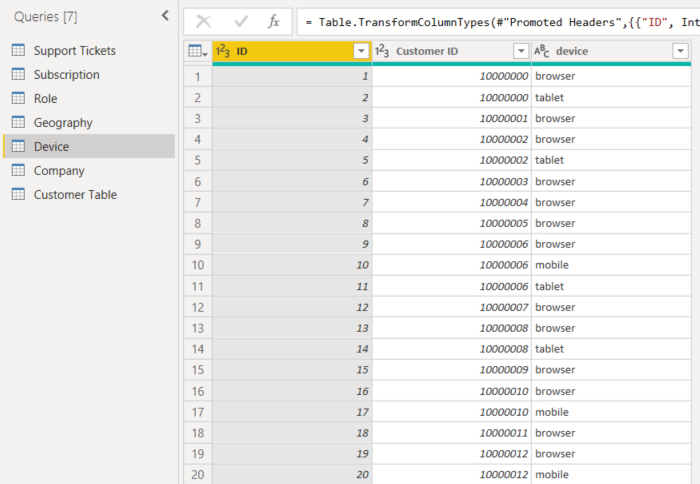 To follow along, open the Customer Feedback PBIX file in Power BI Desktop. You also can download the Customer Feedback Excel file for Power BI service or Power BI Desktop. The Customer Feedback data set is based on [Moro et al., 2014] S. Moro, P. Cortez, and P. Rita. "A Data-Driven Approach to Predict the Success of Bank Telemarketing." Decision Support Systems, Elsevier, 62:22-31, June 2014. Open the report, and select the Key influencers icon. Move the metric you want to investigate into the Analyze field. The Analyze field supports categorical, or noncontinuous, variables only. To see what drives a customer rating of the service to be low, select Customer Table > Rating. To focus on the negative ratings, select Low in the What influences Rating to be drop-down box. The analysis runs on the table level of the field that's being analyzed. In this case, it's the Rating metric. This metric is defined at a customer level. Each customer has given either a high score or a low score. All the explanatory factors must be defined at the customer level for the visual to make use of them. In the previous example, all of the explanatory factors have either a one-to-one or a many-to-one relationship with the metric. In this case, each score has exactly one theme associated with it. This theme was the main theme of the customer review. Similarly, customers come from one country, have one membership type, and perform one role in their organization. The explanatory factors are already attributes of a customer, and no transformations are needed. The visual can make immediate use of them. Later in the tutorial, you look at more complex examples that have one-to-many relationships. In those cases, the columns have to first be aggregated down to the customer level before you can run the analysis. Measures and aggregates used as explanatory factors are also evaluated at the table level of the Analyze metric. Some examples are shown later in this article. Let's take a look at the key influencers for low ratings. The organization in this example has three roles: consumer, administrator, and publisher. Being a consumer is the top factor that contributes to a low rating. More precisely, your consumers are 2.57 times more likely to give your service a negative score. The key influencers chart lists Role in Org is consumer first in the list on the left. 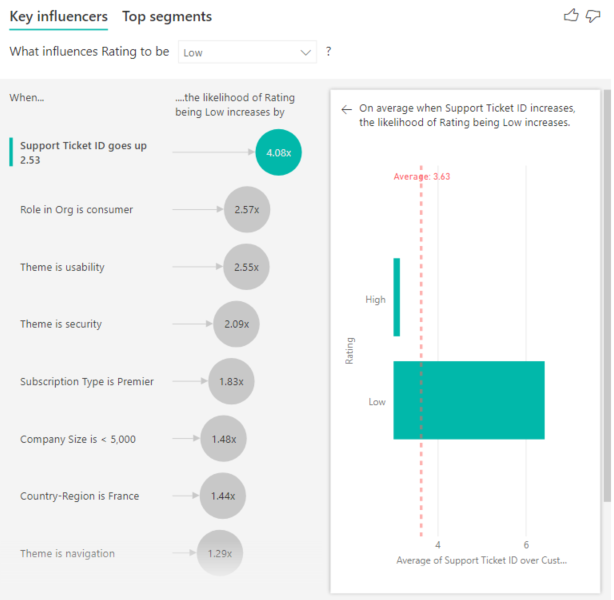 By selecting Role in Org is consumer, Power BI shows additional details in the right pane. The comparative effect of each role on the likelihood of a low rating is shown. 14.93% of consumers give a low score. On average, all other roles give a low score 5.78% of the time. Consumers are 2.57 times more likely to give a low score compared to all other roles. See the difference between the green bar and the red dotted line. 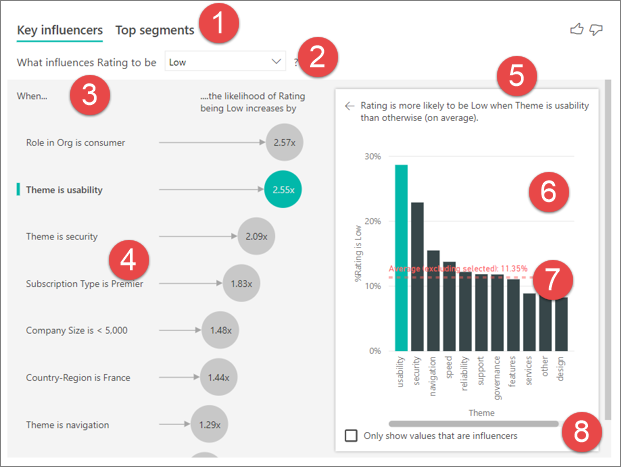 The key influencers visual compares and ranks factors from many different variables. The second influencer has nothing to do with Role in Org. Select the second influencer in the list, which is Theme is usability. The second most important factor is related to the theme of the customer’s review. Customers who commented about the usability of the product were 2.21 times more likely to give a low score compared to customers who commented on other themes, such as reliability, design, or speed. Between the visuals, the average, which is shown by the red dotted line, changed from 5.78% to 11.34%. The average is dynamic because it's based on the average of all other values. For the first influencer, the average excluded the customer role. For the second influencer, it excluded the usability theme. Select the Only show values that are influencers check box to filter by using only the influential values. In this case, they're the roles that drive a low score. 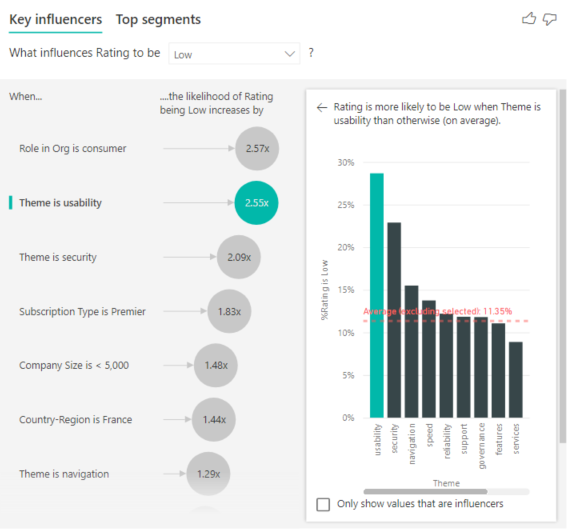 Twelve themes are reduced to the four that Power BI identified as the themes that drive low ratings. 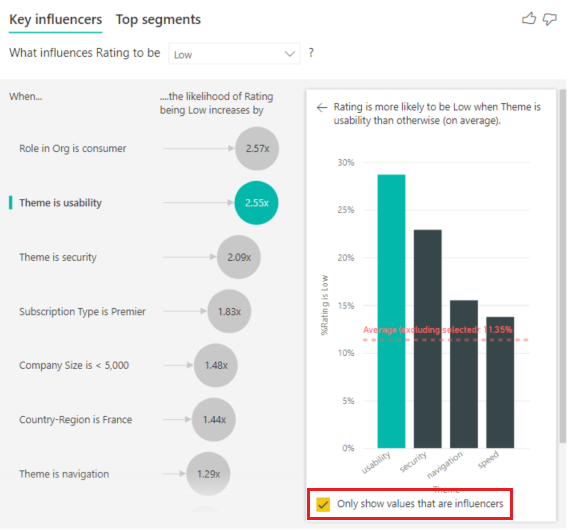 Every time you select a slicer, filter, or other visual on the canvas, the key influencers visual reruns its analysis on the new portion of data. For example, you can move Company Size into the report and use it as a slicer. Use it to see if the key influencers for your enterprise customers are different than the general population. An enterprise company size is larger than 50,000 employees. Selecting >50,000 reruns the analysis, and you can see that the influencers changed. 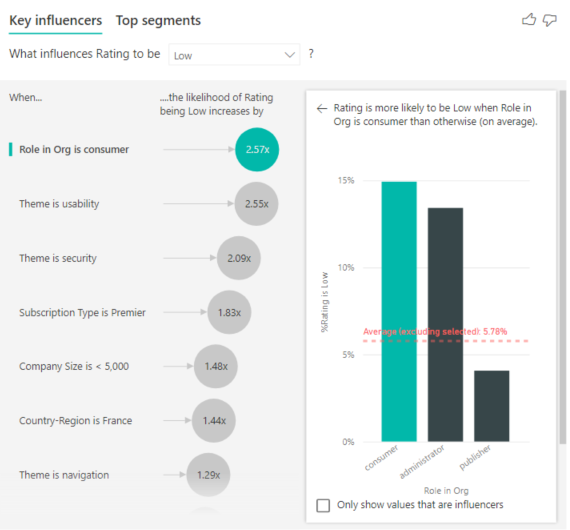 For large enterprise customers, the top influencer for low ratings has a theme related to security. You might want to investigate further to see if there are specific security features your large customers are unhappy about. So far, you've seen how to use the visual to explore how different categorical fields influence low ratings. It's also possible to have continuous factors such as age, height, and price in the Explain by field. Let’s look at what happens when Tenure is moved from the customer table into Explain by. Tenure depicts how long a customer has used the service. As tenure increases, the likelihood of receiving a lower rating also increases. This trend suggests that the longer-term customers are more likely to give a negative score. This insight is interesting, and one that you might want to follow up on later. The visualization shows that every time tenure goes up by 13.44 months, on average the likelihood of a low rating increases by 1.23 times. In this case, 13.44 months depict the standard deviation of tenure. So the insight you receive looks at how increasing tenure by a standard amount, which is the standard deviation of tenure, affects the likelihood of receiving a low rating. The scatter plot in the right pane plots the average percentage of low ratings for each value of tenure. It highlights the slope with a trend line. 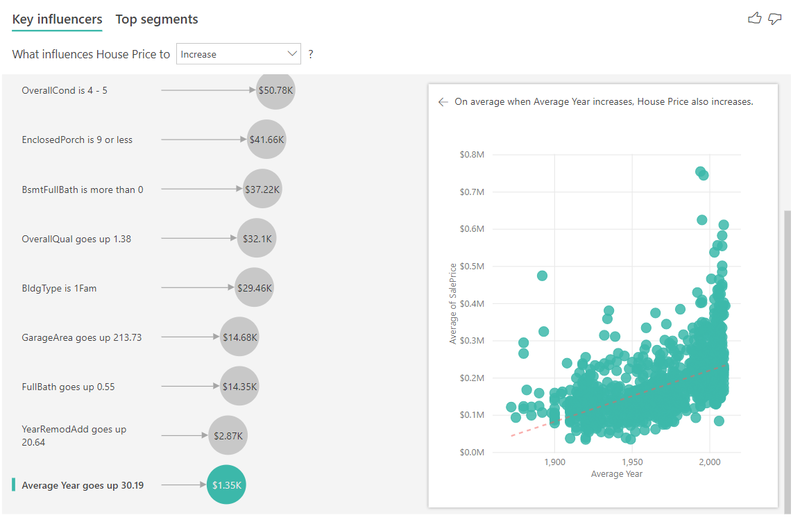 You can use measures and aggregates as explanatory factors inside your analysis. For example, you might want to see what effect the count of customer support tickets or the average duration of an open ticket has on the score you receive. In this case, you want to see if the number of support tickets that a customer has influences the score they give. Now you bring in Support Ticket ID from the support ticket table. Because a customer can have multiple support tickets, you aggregate the ID to the customer level. Aggregation is important because the analysis runs on the customer level, so all drivers must be defined at that level of granularity. Let's look at the count of IDs. Each customer row has a count of support tickets associated with it. In this case, as the count of support tickets increases, the likelihood of the rating being low goes up 5.51 times. 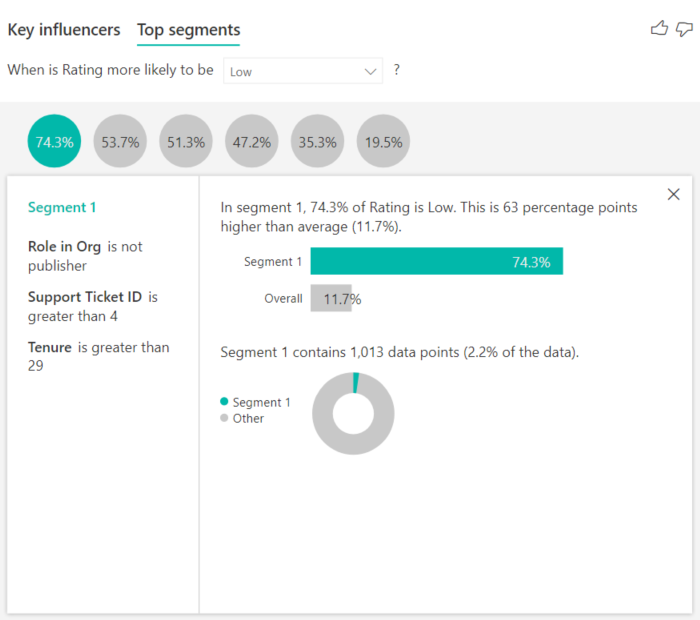 The visual on the right shows the average number of support tickets by different Rating values evaluated at the customer level. You can use the Key influencers tab to assess each factor individually. You also can use the Top segments tab to see how a combination of factors affects the metric that you're analyzing. 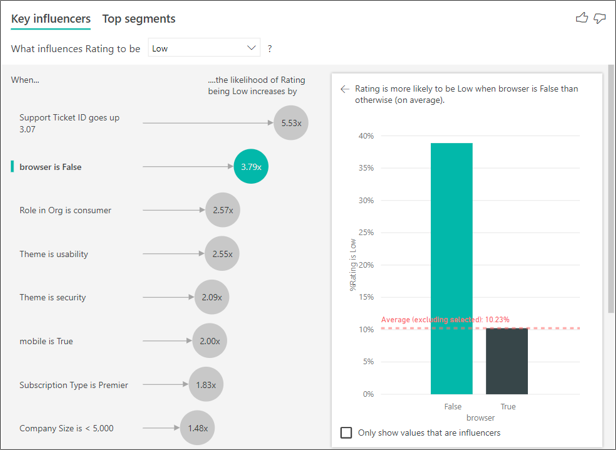 Top segments initially show an overview of all the segments that Power BI discovered. The following example shows that six segments were found. These segments are ranked by the percentage of low ratings within the segment. Segment 1, for example, has 74.3% customer ratings that are low. The higher the bubble, the higher the proportion of low ratings. The size of the bubble represents how many customers are within the segment. Selecting a bubble drills into the details of that segment. If you select Segment 1, for example, you find that it's made up of relatively established customers. They've been customers for over 29 months and have more than four support tickets. Finally, they're not publishers, so they're either consumers or administrators. In this group, 74.3% of the customers gave a low rating. The average customer gave a low rating 11.7% of the time, so this segment has a larger proportion of low ratings. It's 63 percentage points higher. Segment 1 also contains approximately 2.2% of the data, so it represents an addressable portion of the population. If you move a numerical field into the Analyze field, you have a choice how to handle that scenario. 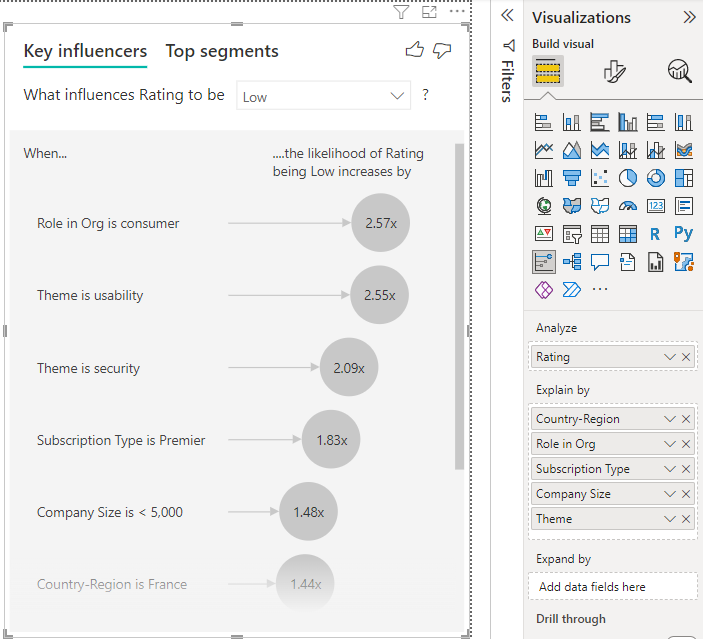 You can change the behavior of the visual by going into the Formatting Pane and switching between Categorical Analysis Type and Continuous Analysis Type. This distinction is very helpful when you have lots of unique values in the field you are analyzing. In the example below we look at house prices. It is not very meaningful to ask ‘What influences House Price to be 156,214?’ as that is very specific and we are likely not to have enough data to infer a pattern. Instead we may want to ask, ‘What influences House Price to increase’? which allows us to treat house prices as a range rather than distinct values. In this scenario we look at ‘What influences House Price to increase’. We are looking at a number of explanatory factors that could impact a house price like Year Built (year the house was built), KitchenQual (kitchen quality) and YearRemodAdd (year the house was remodeled). The number in the bubble is still the difference between the red dotted line and green bar but it’s expressed as a number ($158.49K) rather than a likelihood (1.93x). So on average, houses with excellent kitchens are almost $160K more expensive than houses without excellent kitchens. 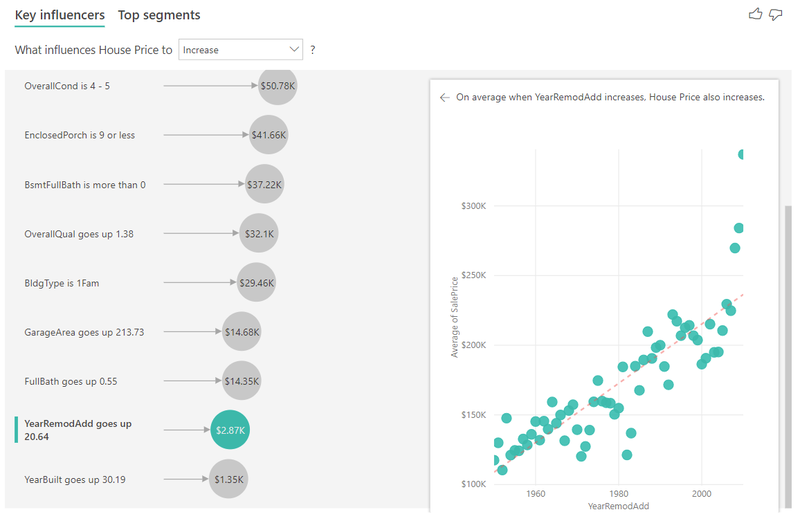 The scatter plot in the right pane plots the average house price for each distinct value of year remodeled. 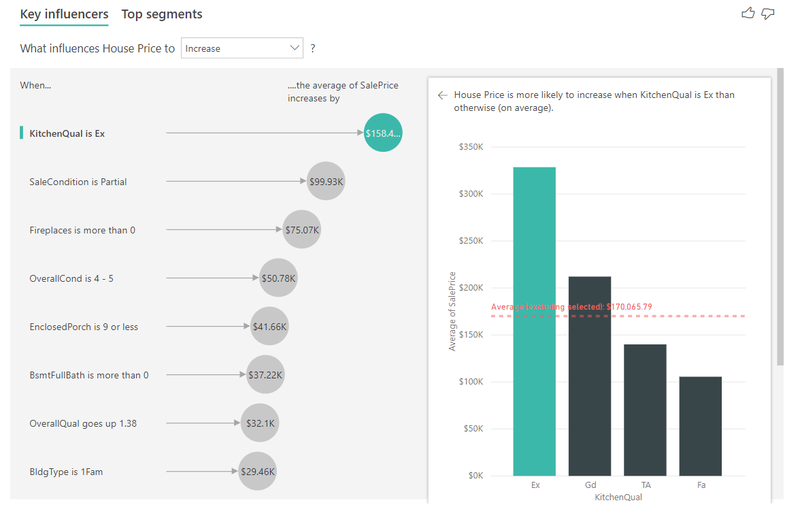 Top segments for numerical targets show groups where the house prices on average are higher than in the overall dataset. For example, below we can see that Segment 1 is made up of houses where GarageCars (number of cars the garage can fit) is greater than 2 and the RoofStyle is Hip. Houses with those characteristics have an average price of $355K compared to the overall average in the data which is $180K. What are the limitations for the preview? Analyzing metrics that are aggregates or measures. 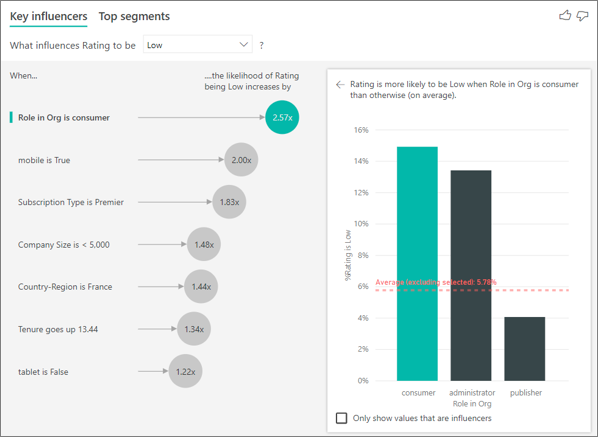 Consuming the visual in Power BI Embedded. 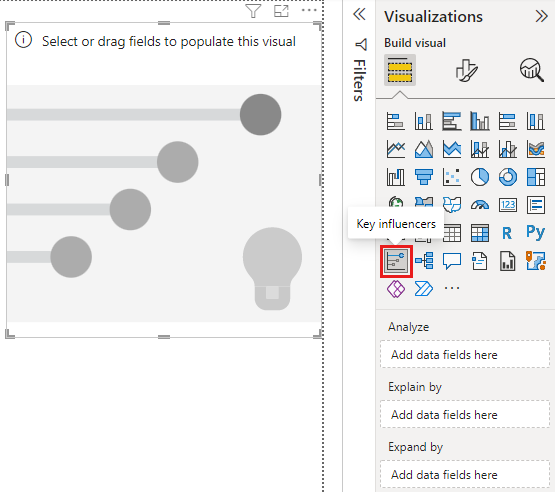 Consuming the visual on Power BI mobile apps. I see an error that no influencers or segments were found. Why is that? 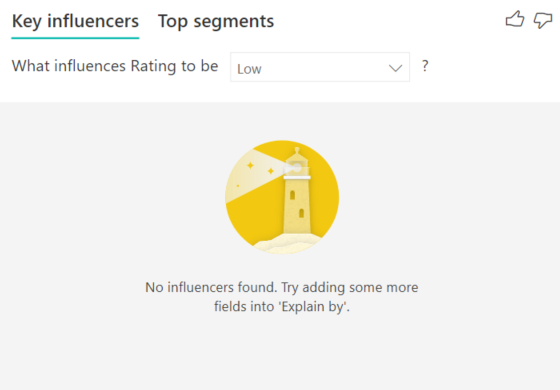 This error occurs when you included fields in Explain by but no influencers were found. You included the metric you were analyzing in both Analyze and Explain by. Remove it from Explain by. Your explanatory fields have too many categories with few observations. This situation makes it hard for the visualization to determine which factors are influencers. It’s hard to generalize based on only a few observations. If you are analyzing a numeric field you may want to switch from Categorical Analysis to Continuous Analysis in the Formatting Pane under the Analysis card. Your explanatory factors have enough observations to generalize, but the visualization didn't find any meaningful correlations to report. I see an error that the metric I'm analyzing doesn't have enough data to run the analysis on. Why is that? The visualization works by looking at patterns in the data for one group compared to other groups. For example, it looks for customers who gave low ratings compared to customers who gave high ratings. If the data in your model has only a few observations, patterns are hard to find. If the visualization doesn’t have enough data to find meaningful influencers, it indicates that more data is needed to run the analysis. We recommend that you have at least 100 observations for the selected state. In this case, the state is customers who churn. You also need at least 10 observations for the states you use for comparison. In this case, the comparison state is customers who don't churn. If you are analyzing a numeric field you may want to switch from Categorical Analysis to Continuous Analysis in the Formatting Pane under the Analysis card. I see an error that a field in Explain by isn't uniquely related to the table that contains the metric I'm analyzing. Why is that? The analysis runs on the table level of the field that's being analyzed. For example, if you analyze customer feedback for your service, you might have a table that tells you whether a customer gave a high rating or a low rating. In this case, your analysis is running at the customer table level. You analyze what drives customers to give low ratings of your service. You want to see if the device on which the customer is consuming your service influences the reviews they give. A customer can consume the service in multiple different ways. In the following example, customer 10000000 uses both a browser and a tablet to interact with the service. You can change the summarization of devices to count. For example, use count if the number of devices might affect the score that a customer gives. You can pivot the device column to see if consuming the service on a specific device influences a customer’s rating. In this example, the data was pivoted to create new columns for browser, mobile, and tablet. You can now use these specific devices in Explain by. All devices turn out to be influencers, and the browser has the largest effect on customer score. More precisely, customers who don't use the browser to consume the service are 3.79 times more likely to give a low score than the customers who do. Lower down in the list, for mobile the inverse is true. Customers who use the mobile app are more likely to give a low score than the customers who don’t. I see a warning that measures weren't included in my analysis. Why is that? The analysis runs on the table level of the field that's being analyzed. If you analyze customer churn, you might have a table that tells you whether a customer churned or not. In this case, your analysis runs at the customer table level. Measures and aggregates are by default analyzed at the table level. If there were a measure for average monthly spending, it would be analyzed at the customer table level. If the customer table doesn't have a unique identifier, you can't evaluate the measure and it's ignored by the analysis. To avoid this situation, make sure the table with your metric has a unique identifier. In this case, it's the customer table and the unique identifier is customer ID. It’s also easy to add an index column by using Power Query. 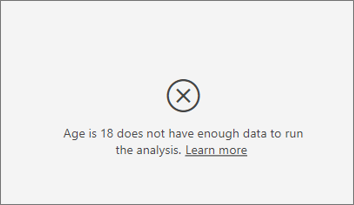 I see a warning that the metric I'm analyzing has more than 10 unique values and that this amount might affect the quality of my analysis. Why is that? The AI visualization can analyze categorical fields and numeric fields. In the case of categorical fields, an example may be Churn is Yes or No, and Customer Satisfaction is High, Medium, or Low. Increasing the number of categories to analyze means there are fewer observations per category. This situation makes it harder for the visualization to find patterns in the data. When analyzing numeric fields you have a choice between treating the numeric fields like text in which case you will run the same analysis as you do for categorical data (Categorical Analysis). If you have lots of distinct values we recommend you switch the analysis to Continuous Analysis as that means we can infer patterns from when numbers increase or decrease rather than treating them as distinct values. You can switch from Categorical Analysis to Continuous Analysis in the Formatting Pane under the Analysis card. To find stronger influencers, we recommend that you group similar values into a single unit. For example, if you have a metric for price, you're likely to obtain better results by grouping similar prices into High, Medium, and Low categories vs. using individual price points. There are factors in my data that look like they should be key influencers, but they aren't. How can that happen? In the following example, customers who are consumers drive low ratings, with 14.93% of ratings that are low. The administrator role also has a high proportion of low ratings, at 13.42%, but it isn't considered an influencer. The reason for this determination is that the visualization also considers the number of data points when it finds influencers. The following example has more than 29,000 consumers and 10 times fewer administrators, about 2,900. Only 390 of them gave a low rating. The visual doesn’t have enough data to determine whether it found a pattern with administrator ratings or if it’s just a chance finding. 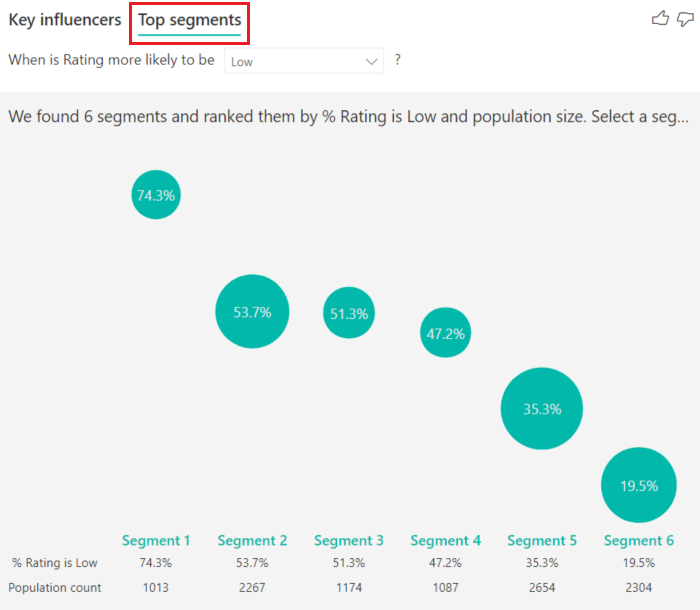 How do you calculate key influencers for categorical analysis? Behind the scenes, the AI visualization uses ML.NET to run a logistic regression to calculate the key influencers. A logistic regression is a statistical model that compares different groups to each other. If you want to see what drives low ratings, the logistic regression looks at how customers who gave a low score differ from the customers who gave a high score. If you have multiple categories, such as high, neutral, and low scores, you look at how the customers who gave a low rating differ from the customers who didn't give a low rating. In this case, how do the customers who gave a low score differ from the customers who gave a high rating or a neutral rating? The logistic regression searches for patterns in the data and looks for how customers who gave a low rating might differ from the customers who gave a high rating. It might find, for example, that customers with more support tickets give a higher percentage of low ratings than customers with few or no support tickets. The logistic regression also considers how many data points are present. For example, if customers who play an admin role give proportionally more negative scores but there are only a few administrators, this factor isn't considered influential. This determination is made because there aren't enough data points available to infer a pattern. A statistical test, known as a Wald test, is used to determine whether a factor is considered an influencer. The visual uses a p-value of 0.05 to determine the threshold. How do you calculate key influencers for numeric analysis? Behind the scenes, the AI visualization uses ML.NET to run a linear regression to calculate the key influencers. A linear regression is a statistical model that looks at how the outcome of the field you are analyzing changes based on your explanatory factors. For example, if we are analyzing house prices, a linear regression will look at the impact having an excellent kitchen will have on the house price. Do houses with excellent kitchens generally have lower or higher house prices compared to houses without excellent kitchens? The linear regression also considers the number of data points. For example, if houses with tennis courts have higher prices but we have very few houses that have a tennis court, this factor is not considered influential. This determination is made because there aren't enough data points available to infer a pattern. A statistical test, known as a Wald test, is used to determine whether a factor is considered an influencer. The visual uses a p-value of 0.05 to determine the threshold. How do you calculate segments? Behind the scenes, the AI visualization uses ML.NET to run a decision tree to find interesting subgroups. The objective of the decision tree is to end up with a subgroup of data points that's relatively high in the metric you're interested in. This could be customers with low ratings or houses with high prices. The decision tree takes each explanatory factor and tries to reason which factor gives it the best split. For example, if you filter the data to include only large enterprise customers, will that separate out customers who gave a high rating vs. a low rating? Or perhaps is it better to filter the data to include only customers who commented about security? After the decision tree does a split, it takes the subgroup of data and determines the next best split for that data. In this case, the subgroup is customers who commented on security. After each split, it also considers whether it has enough data points for this group to be representative enough to infer a pattern from or whether it's an anomaly in the data and not a real segment. Another statistical test is applied to check for the statistical significance of the split condition with p-value of 0.05. 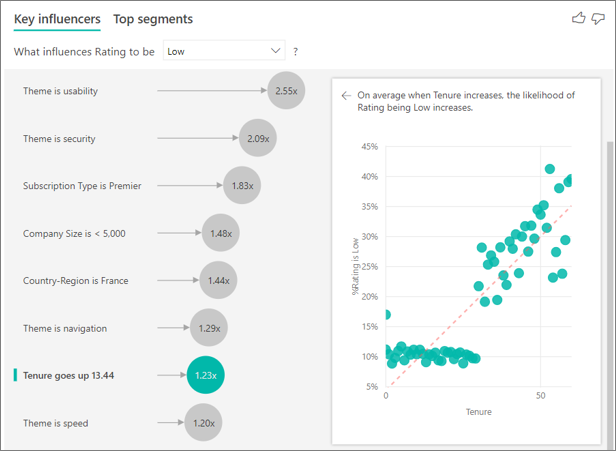 After the decision tree finishes running, it takes all the splits, such as security comments and large enterprise, and creates Power BI filters. This combination of filters is packaged up as a segment in the visual. Why do certain factors become influencers or stop being influencers as I move more fields into the Explain by field? By itself, more bedrooms might be a driver for house prices to be high. Including house size in the analysis means you now look at what happens to bedrooms while house size remains constant. If house size is fixed at 1,500 square feet, it's unlikely that a continuous increase in the number of bedrooms will dramatically increase the house price. Bedrooms might not be as important of a factor as it was before house size was considered.